• 4-in-1 USB Powered Mini Desktop Air Conditioner. • Functions As: Air Cooler, Purifier, Humidifier, Circulator Fan, Nightlight..
• Features built-in water tank that can last up to eight hours. • Delivers a stream of cool air based on the natural water evaporation technology. • Simply fill the tank with water, then plug it into a power source. • You can add your favorite essential oil..
• Great! for offices, homes, work spaces, dorm rooms and so on..
• Comes with 7-Color LED Lights: Blue, Red, White, Teal, Purple, Yellow, Green. • Equipped with adjustable cooling speed control/setting. 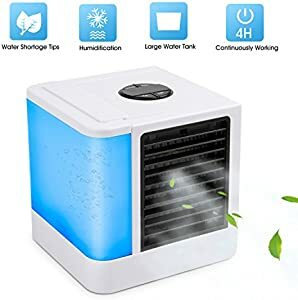 • Operates via any USB power supply connection..
• 100-240V AC, 50/60Hz, 1.5A-2A Max..
• Energy efficient and eco-friendly..
• Free of freon.. No blades..
• Dimensions: 6.5 x 6.5 x 6.7-inches..